The end of the year is right around the corner, and that means New Year’s resolutions will soon begin. But forget about that “New Year, New Me” attitude. Instead, use the new year as an opportunity to explore new and exciting ways to engage your employees, build morale and strengthen employee relationships. Why? Because the long-term success of your company may depend on it. Nearly 70% of employees would work harder if they felt their efforts were better appreciated. The start of a new year is a natural time for companies to look at employee relationships with fresh eyes. Without a doubt, employees are the lifeblood of any successful company. Perhaps an employee made a huge sale, celebrated a big work anniversary or never missed a day of work the year before. One way to show your employees how much you really care about and value the work that they do is to take note of the milestones that they’ve reached during the last twelve months. After all, the employees who helped you meet year-end goals deserve to be celebrated. Ringing in the new year with recognizing career milestones and achieved goals can be very simple. You can do this by rewarding them with some well-deserved extra time off, presenting them with a gift card award to help them celebrate their accomplishment, or by simply saying “thank you” through a keepsake-worthy Hallmark greeting card. The end of the year is the best time to take a good, long look at your employee value proposition. What makes people excited to work for your company? Make these things more visible, recognizable and tangible throughout the year. Doing so will help employees feel more connected to the company, to their work and to one another. 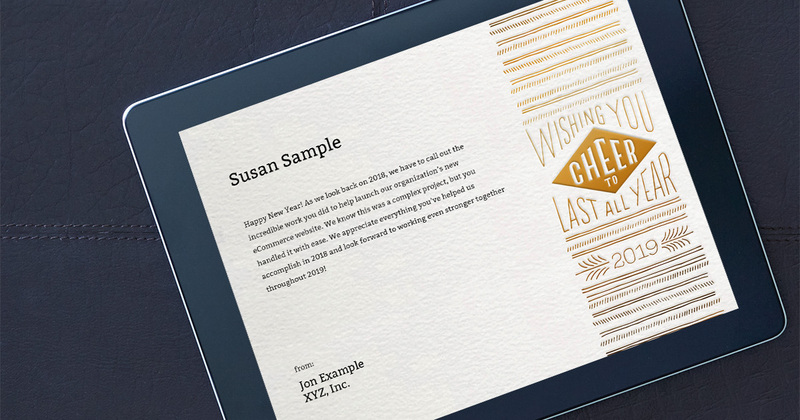 To keep your employees focused and engaged, consider implementing recognition greeting cards and incentives year-round. These constant reminders will reinforce the progress they are making and help them stay connected to your EVP. Along with strengthening your EVP, it’s important to share the company vision for the future and opportunities on the horizon. Adopt new ways to engage employees early, setting the tone for the year ahead and jumpstarting momentum by building a culture of positive reinforcement. Ways you could achieve this are through keeping workers informed about relevant company news, setting attainable short-term goals, implementing incentive programs, encouraging teamwork and allowing employees to grow in their careers. Want to start the new year off with motivated employees, stronger morale and a better sense of company purpose? We can help! We have a solution for every company that believes emotionally engaged employees and customers are critical to long-term success. We look forward to hearing from you. To get in touch with us, simply click here.